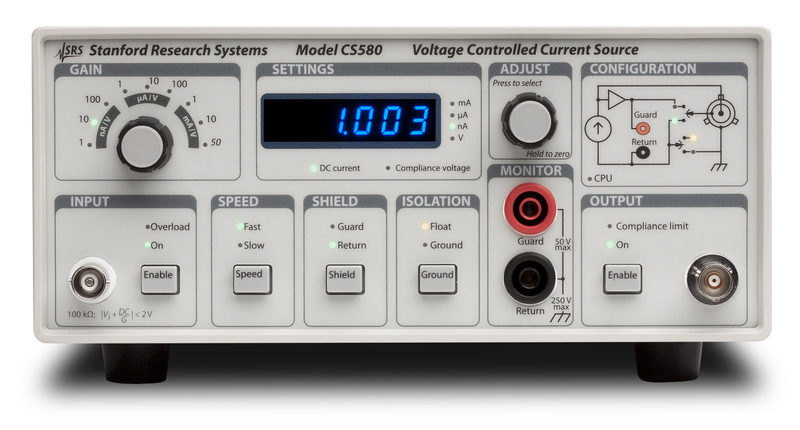 The Model CS580 Voltage Controlled Current Source creates new capabilities for researchers needing an ultra-low noise current source in a flexible, easy to use instrument. The CS580 is a natural companion with sensitive AC instruments such as lock-in amplifiers, providing an easy way of generating precision current directly from an AC or DC control voltage. The instrument sources and sinks current and has an adjustable compliance voltage of up to ±50 V, giving full "four-quadrant" performance. The CS580 is a welcome addition to any research lab studying semiconductors and transport phenomena, superconductivity, and nanotechnology, to name just a few. With up to ±50 V compliance voltage, the CS580 can source and sink precision AC and DC currents from 100 fA to 100 mA. The CS580's ultra-low noise design takes advantage of the best transistors, op-amps, and discrete components available combined with careful high impedance board layout to achieve the highest performance possible. The design even features linear power supplies rather than switching power supplies, so switching frequency interference can never be a problem. An actively driven guard provides the greatest bandwidth (up to 200 kHz) and lowest possible leakage current. There's also a buffered monitor output for high impedance voltage measurements. Front-panel instrument configuration is managed by a microcontroller whose system clock only oscillates during the brief moments needed to change instrument settings. The drive electronics are completely static, with no “scanning” or refresh to generate the slightest interference. Whenever the microcontroller becomes active, the "CPU Activity" indicator illuminates, clearly showing when the digital clock is running. This occurs in response to front-panel button presses or remote computer commands. But when the microcontroller is not active, there is absolutely no digital interference at all. There is an RS-232 computer interface on the rear panel of the CS580. All functions of the instrument can be set or read via the interface. When sending commands to the instrument, the CS580's microcontroller will be activated, and digital noise may be present. 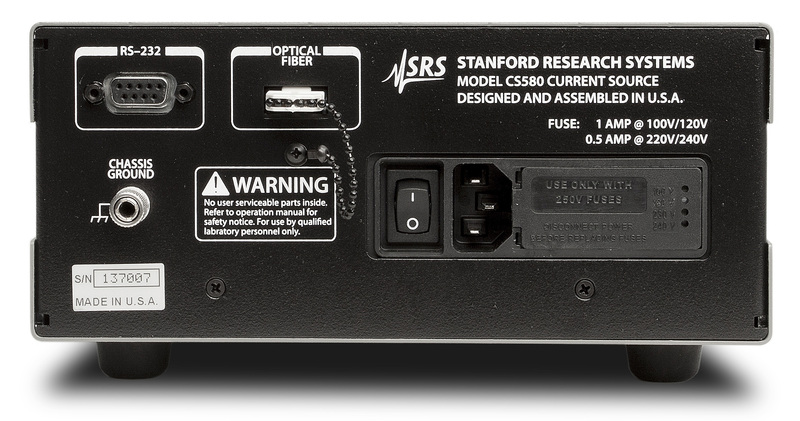 For remote interfacing with complete electrical isolation, the CS580 also has a rear-panel fiber optic interface. When connected to the SX199 Remote Computer Interface Unit, a path for controlling the CS580 via GPIB, Ethernet, and RS-232 is provided.